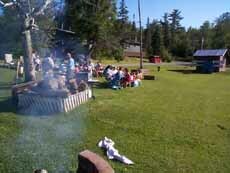 Larsson's Camp is truly a family camp. 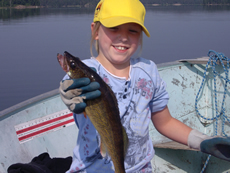 Our convenient location, the ease of fishing Caliper (our home lake), and the variety of activities offered in the area makes Larsson's Camp the perfect family vacation destination. Convenient, affordable, and fun! Our Monday night cookouts are a real guest favorite. 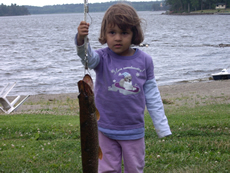 Each Monday (between May and mid August) we host a cookout on the shore of Caliper Lake. All the guests in camp are invited to attend. Drop by for a refreshment, some fresh caught fish, and our mouth watering deep fried turkey injected with our secret blend of seasonings. Of course there are marshmallows for the kids (of all ages), and plenty of great conversation. It's an excellent opportunity for our families to get to know yours a little bit better. Children 12 and under stay free on the Housekeeping Plan. 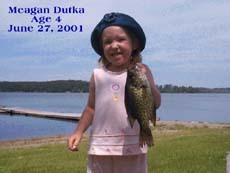 Reduced rates for children 12 and under on the American Plan (please visit our rates page for exact rates). Free use of a boat and motor package (not including fuel) for the duration of your stay. Free canoe and/or paddleboat rental during your stay. Rate for TV/VCR rental reduced from $15 per day to $7.50 per day. Over 300 no charge movie rentals available. This special applies for both cabin and motel accommodation bookings. The family group must consist of at least one adult and one child. 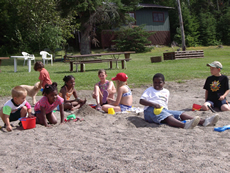 Each family group must book separate accommodations to qualify for the special. Only one boat and motor package per family group/accommodation booked. Boat and motor packages are subject to availability at the time of booking. Reduced rate and no charge items may not be substituted for accommodations discounts. This special may not be combined with any other specials offered. 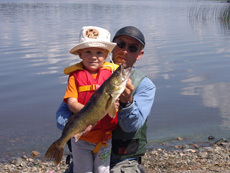 Go fishing on our home lake or one of our boat cache “outback” lakes. 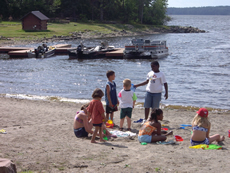 Visit Caliper Lake Provincial Park, across the lake from our lodge. It has a playground, a large beach, and some excellent nature trails. Take an aerial tour of the area, offered through both flying services in Nestor Falls. Go trail riding, offered in Devlin, about 40 minutes away. Take a canoe or paddleboat and enjoy the beauty of Caliper Lake. 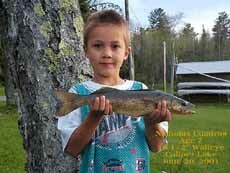 Take a day excursion by canoe from Caliper Lake, up the Log River towards Big Pine Lake. See a tremendous variety of wildlife. Challenge your neighbors (including your hosts, if you’re feeling lucky) to a game of horseshoes, or badminton. Tennis anyone? Courts and equipment are located at the travel information centre in Nestor Falls. Sit on one of the docks and catch one of the most beautiful sunsets you’ve ever seen. 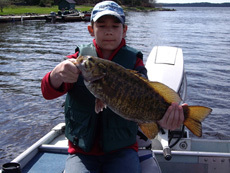 Go ice fishing, the lakes AND fish are plentiful! Jump on your sleds and explore the Canadian Shield. For the golfer, there are two beautiful courses in the area. Head out on Caliper and look for our resident loons, ducks, herons, osprey, and bald eagles. Visit the municipal landfill site, 1/2 mile south of our lodge. During the evening, the black bears put on quite a dinner show! Spend and evening in the lodge. There’s pool tables, video games, shuffleboard, darts and over 900 satellite channels. Raining? Feel free to borrow books or games from the lodge. We have over 300 movies available, and TV/VCR units available for rent. Scout for blueberries in open mossy areas along our shorelines. Best in early August. Hot? Jump in off our floating diving platform, or enjoy the soft sandy bottom off our sand beach. Have a bonfire on the point of our cove.